Resident Kapit, Joseph Belayong (second right) handing out a camera to a Panda CLICK! workshop participant. Kapit, SARAWAK: As an innovative approach for Sarawak, rural communities in Song District and Baleh were being introduced to Panda CLICK! which is an interactive conservation approach. The word Panda is synonym with World Wide Fund for Nature (WWF) that uses panda as its logo while CLICK! is the acronym for ‘Communication Learning towards Innovative Change and Knowledge’. Panda CLICK! uses visual communication to document events related to communities and their surrounding environment, and it has been used widely in Indonesia to advocate for positive changes among rural communities. WWF-Malaysia and WWF-Indonesia recently held the Panda CLICK! 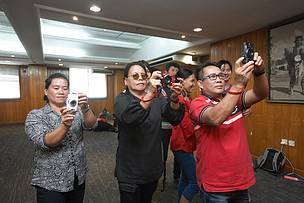 photography training workshop on 21 to 23 June, for about 20 villagers from Rumah Peter, Song; Rumah Engsong, Nanga Kain and Long Singut, Ulu Baleh. A subsequent training was held on 31 July to 1 August to villagers from Rumah Dagum, Song. He also hoped that Panda CLICK! can be extended to communities in Belaga. Among those present were Bukit Mabong District Officer, Douglas Pungga and Song District Officer, Jackline August. Besides imparting basic photography skills to participants of different ages, they also learned how to write simple stories based on photos taken. 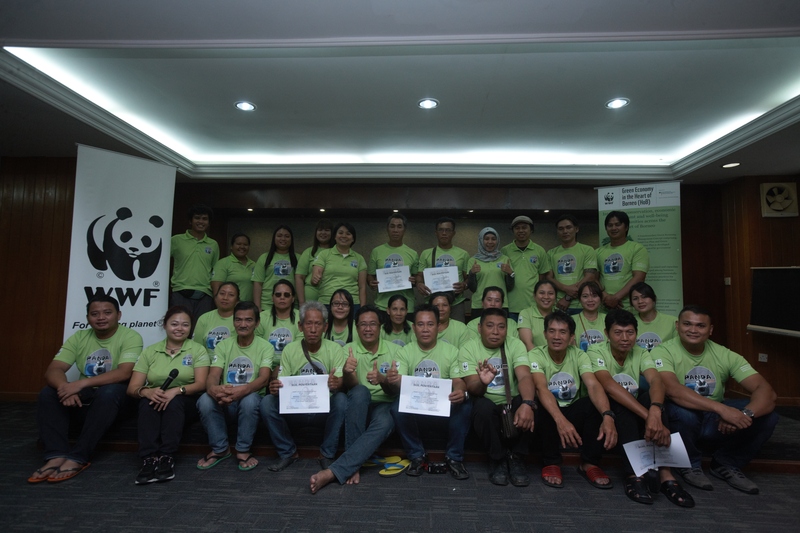 Over a six-month period, WWF-Malaysia lent pocket digital cameras to participants to capture how they view their surrounding areas. Images and stories from this project will be published into a book, followed by a photo exhibition to showcase their daily life in Kapit and Song. 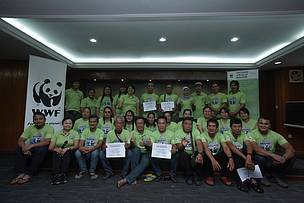 It is also done with the hope that participants can change their perception of the environment and as a way to empower the community as nature’s stewards through photography. Through this programme, villagers can document the attractions they have in their respective villages as well as the difficulties they face in relations to the environment, biodiversity landscape, socio-economy and traditions. This programme is part of the transboundary conservation project, Green Economy in the Heart of Borneo (HoB), and is supported by the International Climate Initiative (IKI), Federal Ministry for the Environment, Nature Conservation, Building and Nuclear Safety of Germany. Green Economy in the HoB is a project that covers a two-million-hectare site, spanning northern West Kalimantan to the central of Sarawak. This area has been identified for a HoB Transboundary Corridor project, funded under the International Climate Initiative, Federal Ministry for the Environment, Nature Conservation, Building and Nuclear Safety of Germany. The corridor project aims at developing a green economy management concept that promotes environmentally-friendly resource use and production within the transboundary HoB Corridor for West Kalimantan and Sarawak. This project is situated within the HoB Corridor Initiative that aims at creating an ecological connectivity between protected areas and different land uses that spans Brunei Darussalam, the two Malaysian states of Sabah and Sarawak, and four Indonesian provinces of West, Central, East and North Kalimantan. Participants eagerly trying out their photography skills after receiving cameras from WWF-Malaysia. 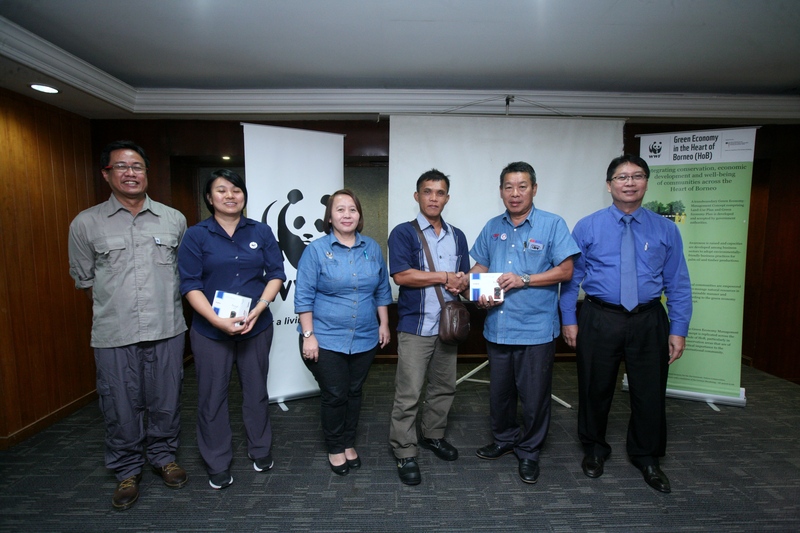 WWF-Indonesia Technical Support Unit Head and Panda CLICK! trainer, Jimmy Syahirsyah teaching participants how to use digital cameras. Smile! Participants posing for a group photo with trainers and organisers after completing their intensive three-day workshop.